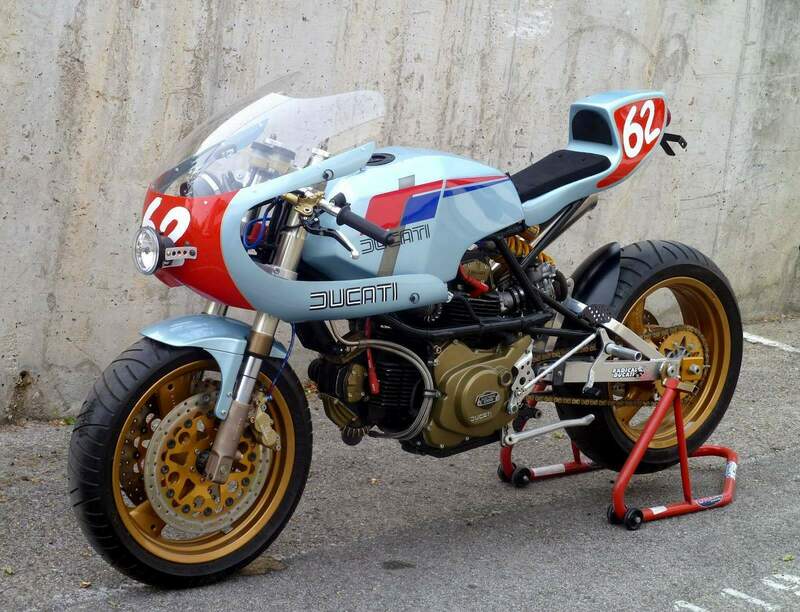 As a tribute to the Ducati Pantah, Pepo decided to breath new life into a donor Cagiva Alazzurra 350. To shed a little light on the importance of the Pantah, this was the first of the belt-driven camshaft Ducati motors, more specifically, the first generation of the current Ducati V twins. It was first showcased in December of 1979 and it came to market in 1980 with the 500SL model; the last model of the line being the 650SL model which was sold in 1986. After completely taking apart the Alazzurra, Pepo refinished and modified the frame to accept a cantilever shock system for the aluminum TT1 swing arm. 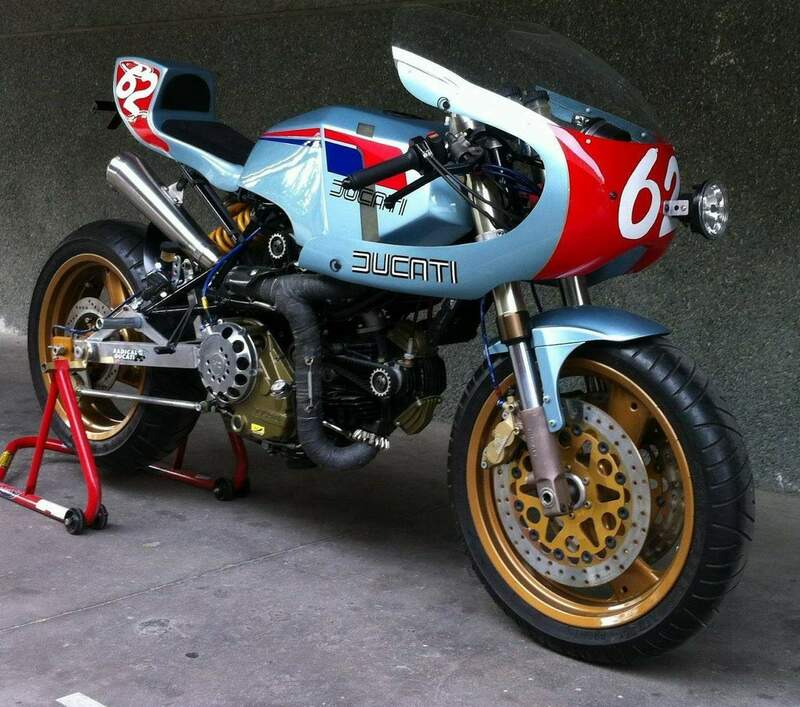 The stock 350cc engine was replaced with that of a Ducati Paso 750cc, which in turn was modified. The Paso 750 engine received a F1 Montjuich rear head, ported heads, big valves, TT2 camshafts, lightened flywheel. The engine was balanced and blueprinted. The reason behind the rear head was to have the Dell’Orto PHM 41mm carburetor rear mounted as 1980′s Pantah did. 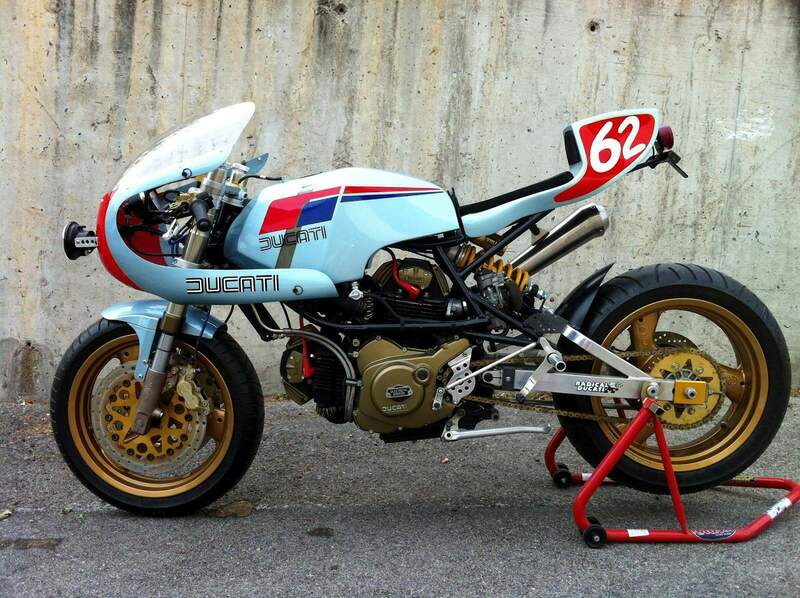 Pederccini 2.4 ignition units, Dyna coils, NGK race spark wires and a handmade race wiring harness. 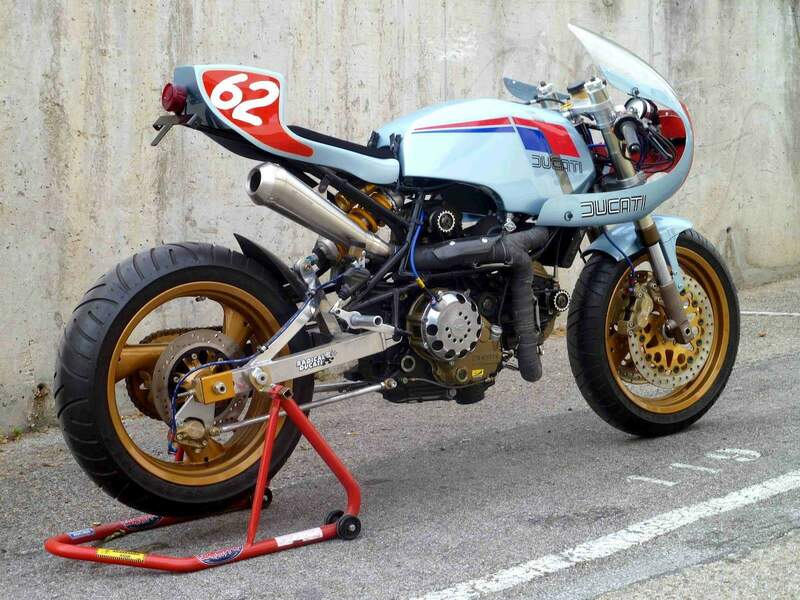 In terms of suspension, at the rear there is a Ohlins shock absorber and at the front, forks from a Ducati 851. For the exhaust system Pepo chose the 2-1 Wolfman with a Spark GP type megaphone can, The RAD 02 Montjuich TT modified fiberglass solo seat is attached to the RAD rear frame. The Wolfman design gas tank is a fiberglass RAD Pantahstica unit with ergal gas cap and the front fairing is a Ducati single race piece. A set of golden Ducati Monster wheels where the perfect choice to keep in theme with this build. Brembo rotors, SS calipers and radial PR-19 brake pump were chosen to help it stop. -Frame modified to mount cantilever shock system. -RAD Pantahstica fiberglass fuel tank (Wolfman design) with ergal gas cap. -PASO 750 engine with F1 Montjuich rear head (for rear mount carburetor as Pantah), ported heads , big valves, TT2 camshafts, lightened flywheel , blueprinted engine.